Can Be Gently Bent to Adjust Sizing, Fits up to a 46 inch Chest. This breastplate in particular is made entirely in 18 gauge steel, and it features ornate little touches of engravings across the chest to enhance its overall design. Curved lines are etched into the edges of the breastplate, while matched line patterns adorn the sides and the centerline of the plate, while also featuring an ornately curled fleur de lis symbol across the breast. The breastplate comes complete with leather straps, which are perfect for securing it onto your core. 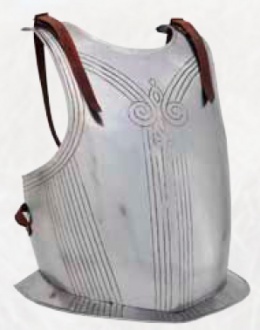 The breastplate is offered in one size, and given the 18 gauge stainless steel construction, the edges of the plate can be gently bent to help it accommodate almost any size. This page was last modified on 12 December 2013, at 19:24.